Chatfuel offers a great and easy to understand environment to build simple bots, really fast. 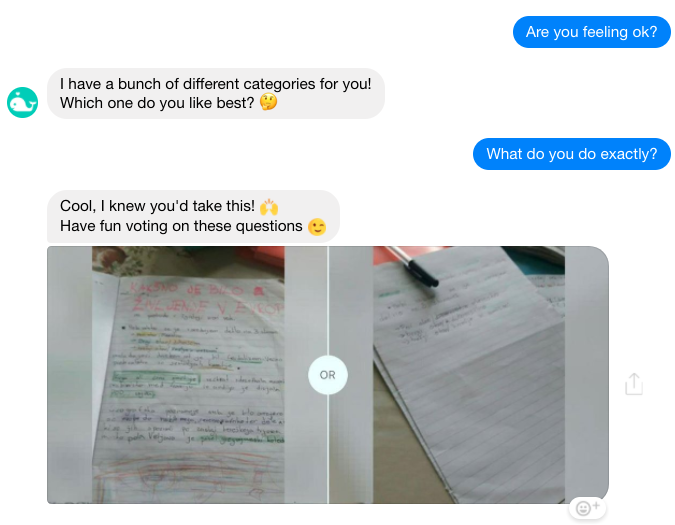 Since the bot’s actions are triggered with button clicks, it’s incredibly easy to mockup a conversation flow and deploy it to Messenger. Yet, experienced bot builders will tell you: the actual user inputs your bot will get are impossible to predict exhaustively, sometimes absurd and quite often senseless. A pure input-output logic will sadly not get you very far. Some people just won’t click the buttons and type weird questions instead. To give you some perspective, one of the most triggered intent on one of customer support chatbot for a bank is @ask-joke. You would think people have better things to ask to their digital bank clerks – the reality is that most users want both: the facts and the fluff. Knowing this reality is one thing, handling it is another. If you fail to handle fluff in a satisfying manner, you’ll leave your users deeply frustrated. The good news is that integrating Natural Language Processing with SAP Conversational AI to your existing Chatfuel bots only takes minutes, and I’ll guide you along the path. Find a comfortable spot, and get the stopwatch ready. Now it is the time to plug a SAP Conversational AI brain into your Chatfuel’s bot! The train tab is the default view on your bot, and it displays its intents. An intent is a “box” of sentences that all carry the same meaning, even though they can be very different to one another. When a user sends some text to your bot, our algorithm compares it to the phrases in your intents. Then it checks if it’s close enough to one of them and decides what the intention of the message is. This means that your bot already knows how to recognize 16 different meanings in hand typed messages. If you want to learn how to create new intents or improve the existing ones, I invite you to give a look at this tutorial. The Build tab is where you find Bot Builder. 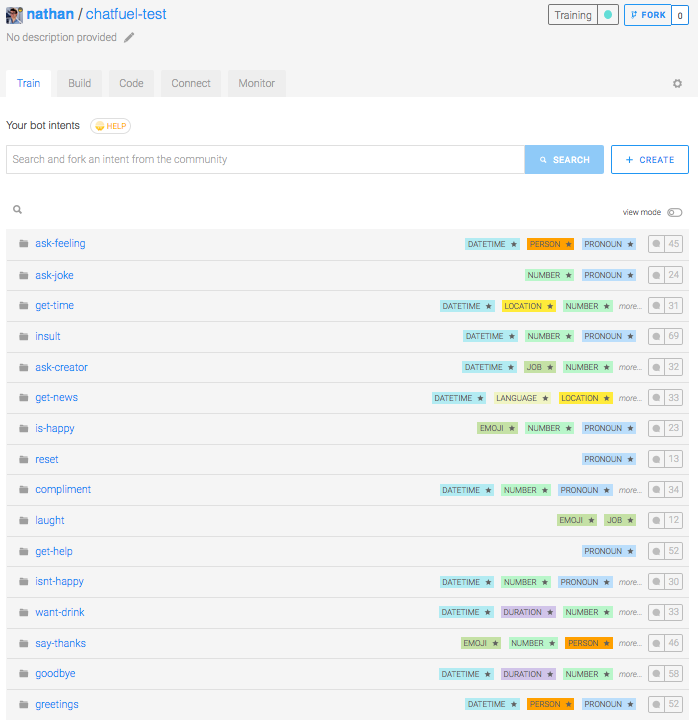 It helps you construct the conversation flow of your bot using Skills. Each Skill represents one thing that your bot know to do, and they can interact with each other. You can already see the two default skills, greetings and small-talk picked during the creation of the bot. The two premade skills are very simple: they are triggered if the user message contains a certain intent and answer with a message depending on the intent. The skill greetings takes care of the intents greetings and goodbye, and the skill small-talk handles the 14 others. If you want to edit the default skills, go to their Actions tab and click the pen to change the content of the message. Unfortunately, SAP Conversational AI and Chatfuel don’t speak the exact same language. The JSON output from SAP Conversational AI’s Bot Builder is not formatted exactly as Chatfuel API expects. Let’s code a simple NodeJS proxy to solve this issue. 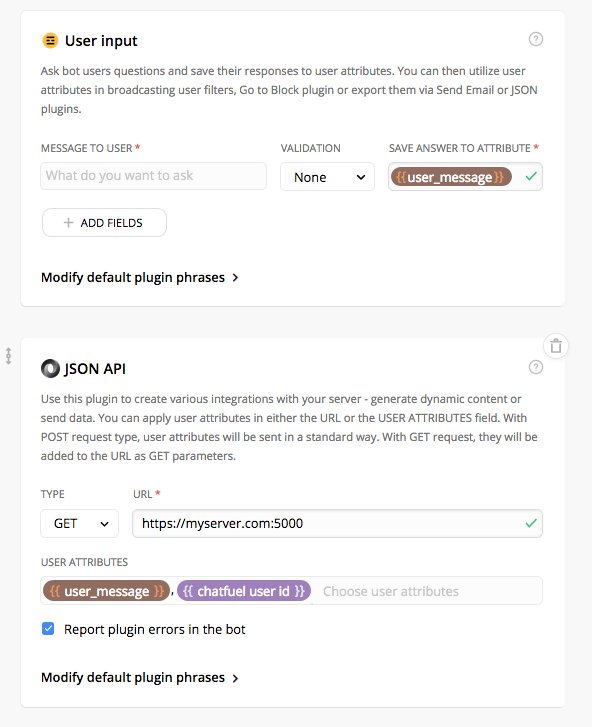 We’ll set up a simple HTTP server that receives events from Chatfuel, calls SAP Conversational AI’s Bot Builder API with the message sent by Chatfuel and returns the messages configured in your Skills. Then copy the following script to a .js file. In this code, don’t forget to add you bot’s request token (you can find it on your bot’s page > Settings > Tokens). Now you should host this code on a public server so that Chatfuel send requests to your API.You can try Ngrok if you want to expose publicly a port of your local computer. Finally, we need to configure Chatfuel to send a request to the proxy when the bot receives a free-typed message. This will save the user message to a variable named user_message, and send a request using JSON API block to the proxy we created with two parameters: the message and a user id, to keep track of conversation states on SAP Conversational AI. Even if you have a functional Smalltalk module as is, you may want to personalize the texts of your bot, create new intents or improve the detection of your bot. Everything you need to know about Intents and Skills is explained in this tutorial. Take your time to improve the quality of your bot’s Smalltalk, it’s a very important part of its identity, and you will notice a much stronger engagement. The personality of a chatbot is a determining factor of its user retention rate. Thank you very much for following along! We would be very happy to have your feedback on how small talks impacted your existing bots. And remember you’re very welcome to contact us if you need help, trough the comment section below or via Slack. Great and intelligent article, but I must dosagree about one thing. May I remind you that a bot SHOULD CONVERS WITH PEOPLE. This is the most (almost the only) strong advantage of bots. The conversation act. Now, you would never let any one who is not a programmer to program your software. You would never let someone who is not a mechanic, to fix you car. And I can go on with lots of examples. So why Do you think that the “script” part should be treated like anyone can do it? Like it’s a gimic? I have a guess why… 🙂 Don’t feel insulted, but it’s probably you, yourself, has no clue about it. You probably have never created, formatted, shaped a real written conversation, with all needed aspects inside. Could you please elaborate this part? I have seen other tutorial in which Dialogflow was coupled with Chatfuel. In one of this tutorial they used Runkit. Is it possible to have a similar example with Recast + Chatfuel? I tried to implement that with a glitch server. (node:8327) [DEP0018] DeprecationWarning: Unhandled promise rejections are deprecated. In the future, promise rejections that are not handled will terminate the Node.js process with a non-zero exit code. (node:19698) DeprecationWarning: Unhandled promise rejections are deprecated. In the future, promise rejections that are not handled will terminate the Node.js process with a non-zero exit code.